I read recently that Fidel Castro is endorsing Bernie Sanders for president of the United States. If it was not so serious it would be humorous. The above is not unique to the Augusta Chronicle. World News Daily, today, again featured an article from its editor basically pointing to the same conclusion. The Israeli press earlier this month broke the story that Sanders, who is Jewish, spent several months at an Israeli commune co-founded by a Soviet spy. The revelation is just now wending its way through the American media, where it’s been confirmed by none other than the New York Times, though the pro-Democrat paper predictably buried the story on its back pages. While many are seeing that Bernie Sanders is some type of a communist, many Americans do not realize that the USA has been moving towards being communist itself the past several years. So, basically Pravda was saying that the USA has been turning communist, but Americans are basically too stupid to see it. As far as Pravda goes, several years ago it decried the fact that the USA was ceasing to be a capitalist nation, but instead claimed that “the American decent into Marxism is happening with breath taking speed” (for more details, see Election Demonstrating Socialist Shift in USA? or ICG, Russia, and the Whimper of American Capitalism). Anyway, Bernie Sander’s Democratic party opponent, Hillary Clinton, says she basically wants to continue Barack Obama’s policies. Bernie Sanders, himself, says that they need to become even more ‘socialist’ (by which he means more towards communism). In many ways, the USA has become more like the communist nations it opposed decades ago. The federal government of the USA no longer believes in many privacy or legal rights, it detains people for suspicions without charges, collects data without court orders, has government required health care, restricts the travel of more of its citizens, and seems to be more involved with ‘wealth redistribution’ than wealth creation. This does not bode well for the USA whether or not Bernie Sanders or Hillary Clinton can win. 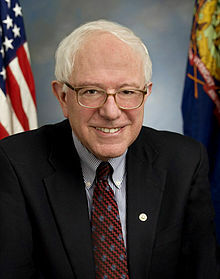 Now, one area that Bernie Sanders differs from communists is that Bernie Sanders is more open to drug legalization (see Bernie Sanders proposes a ‘marijuana nation’)–communist governments have normally been opposed to this. Interestingly, former pro-wrestler and Minnesota Governor Jesse Ventura recently said that if Bernie Sanders loses, he would run for president, apparently as an independent. Jesse Ventura is in favor of some of Bernie Sanders’ positions, including on drug legalization (see Jesse Ventura: If Sanders loses, I’ll run). The USA is going in the wrong direction and needs the Kingdom of God. This entry was posted on Tuesday, March 1st, 2016 at 8:00 am	and is filed under Prophecy.